The Kaiser Family Foundation does regular polling about the public’s view of healthcare reform, and the results are always interesting. This month’s results, however, are even more interesting than usual. I might write a longer post about some of this later, but for now I just want to briefly highlight a few of the questions that most caught my interest. The full poll results are here. My top five most interesting results are below. 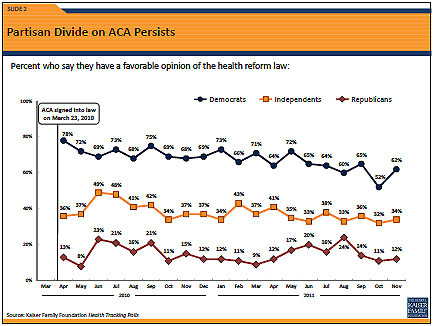 Overall favorability toward Obamacare has gone down only slightly since last year. But look at the partisan breakdown: Republicans and Independents have stayed rock steady the entire time. The decline has been almost entirely due to waning favorability among Democrats. 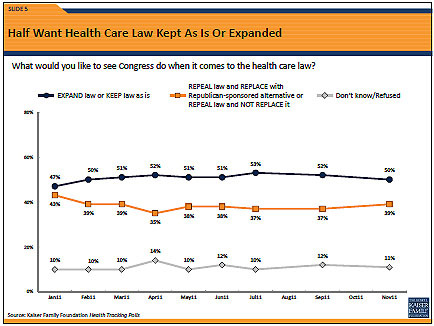 Among those who don’t like Obamacare, nearly half admit that their dislike has nothing much to do with the law itself. They’re just mad at Obama and/or Washington DC. 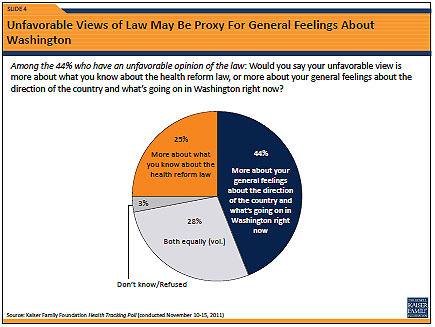 Only 37% of the public feels favorably toward Obamacare, but 50% want to keep or expand it. It turns out that many of the unfavorable/don’t know opinions aren’t from people who dislike healthcare reform, they’re from people who don’t think Obamacare went far enough. 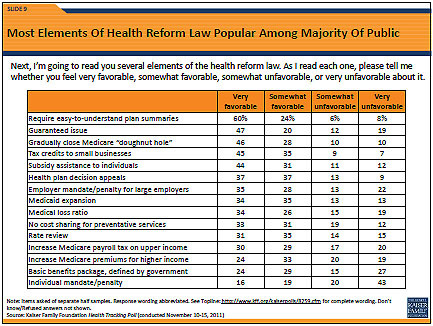 Virtually every specific aspect of Obamacare is viewed favorably by over half the public. The only exception is the individual mandate. Even Republicans, it turns out, like most of the specific provisions of the law. 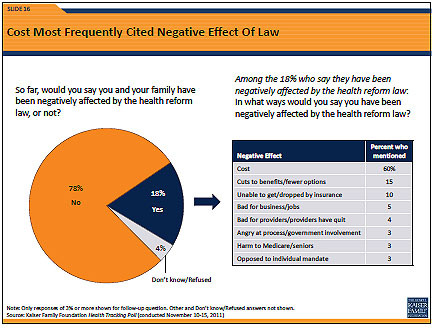 A fifth of the public says Obamacare has affected them negatively. But nearly all of this is because people have been convinced that Obamacare has caused their premiums to go up and their benefits to go down. Needless to say, this is nothing more than a fantasy fueled by Fox News.